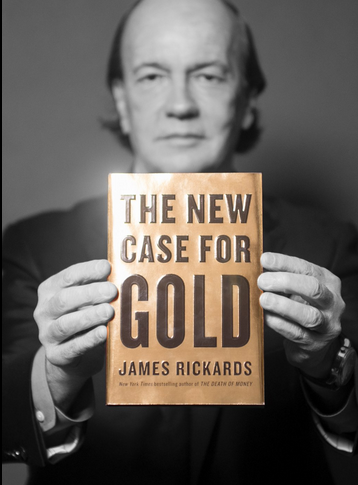 A synopsis of an interview with Jim Rickards, New York Times bestselling author of The Death of Money, Currency Wars, and the newly released bestseller The New Case for Gold by CBC The Exchange. Hedge Against Inflation or Deflation? 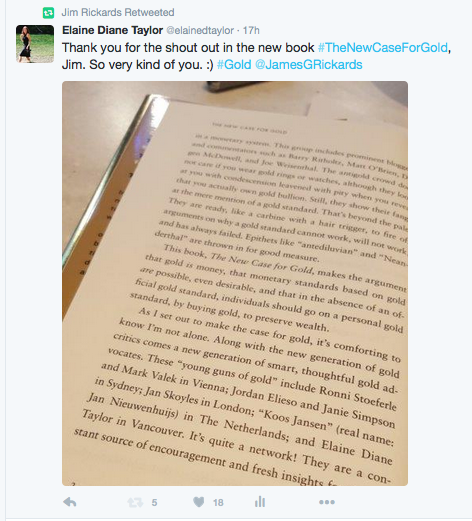 Gold trades differently at different times. Sometimes it trades like a commodity on the commodities index and sometimes as an investment in terms of investor’s portfolio allocations. But sometimes gold trades like money. Right now the increase in the dollar price of gold is just a reflection of the decline of the dollar. So it’s like a vote of no confidence in central bank policies. When the price of gold is going up it just means the dollar is going down. The textbooks tell you it’s a hedge against inflation, which it is, but the history books tell you it’s the best hedge against deflation. The longest sustained period of deflation in U.S. history was 1929 to 1933. It was the longest period of deflation the U.S. had ever had, and the price of gold went up 75% from $20 per ounce to $33 per ounce. Just two weeks ago, Ken Rogoff, former chief economist of the IMF and a professor at Harvard University, said emerging market economies should devote 10% of their reserves to gold. He said not to worry if it’s in short supply because the price will go up. Gold does well in deflation because governments are desperate to avoid it. They actually want inflation. They tell you that as part of their policy. But they’ve tried everything to get the inflation — QE 1, QE 2, QE 3, Helicopter Money, Currency Wars, Operation Twist, Forward Guidance — and they cannot get it. There’s one way to get inflation and that’s to make the price of gold higher. If the Fed does that then there’s your inflation because if gold went up that much then gasoline would be $10 per gallon at the pump and silver would be $100 per ounce. Oil, wheat, steel… everything would go up. When you’re desperate to avoid deflation you can get inflation by raising the dollar price of gold. That’s worked before and it’ll work again. Jim’s expecting it to go to $10,000 per ounce. One of the chief economists at PIMCO, the largest bond dealer in the world, owned by one of the largest insurance companies in the world, came out two weeks ago and suggested the same thing. Jim first said this scenario in his book in 2011 and now the chief economist at PIMCO is also saying it. $10,000 per ounce is the implied non-deflationary price. That price isn’t just pulled out of thin air or made up to be provocative. The price of $10,000 per ounce comes from taking all the gold in the world and all the money in the world, and dividing one by the other using 40% back up of gold. That’s the price gold would have to be to restore confidence in the monetary system without causing deflation. We should be worried about a collapse in the international monetary system. It’s happened three times in the last one hundred years – 1914, 1939 and 1971. So it does happen every thirty of forty years or so. Jim talks about this but he’s not the only one. He recently had conversations with Ben Bernanke, former chairman of the Federal Reserve, and John Lipsky, the only American who ever headed the IMF. Two separate conversations nine thousand miles apart, but they both used the same word to describe the international monetary system — incoherent. It means there’s no anchor. There’s no gold anchor. There’s no dollar anchor — we had a de facto dollar standard from 1980 to 2010. We wake up every day and it’s jump ball in terms of currency valuations. That’s why you have the currency wars. It’s a very dynamically unstable system. It will collapse unless there’s some kind of effort at reform. Countries like Canada or France could be leaders in calling for an international monetary conference. Jim thinks it would be welcomed by the heads of the IMF, BIS, G20 and other central banks.